In which I’m late by any count. By “this” I definitely mean “sleep” and not “inking and watercoloring”, because oh my god do I have a lot of that to do still. On top of the comics I’m working on, all the seniors at CCS have to do a sort of mini-visiting-artist lecture during the next two weeks in which we give a brief rundown of the details of our thesis, our goals for the year, our advisor, and our progress so far. As part of this presentation, we have to create one or two posters that includes similar information. These are the posters that took me all of Sunday night….and they’re still not done! I have a lot of watercoloring left to do, as well as one or two design tweaks, plus a bunch of original art for the Powerpoint to accompany my presentation. In short, I have a hell of a lot to do in the next few days. On the plus side, though, that means I should have a fair amount of art to post here…as long as I don’t just pass out face down on the keyboard when I try to update. Well, it’s pretty late here, so I think I’ll go to bed so that I can have a clear head for cooking tomorrow. 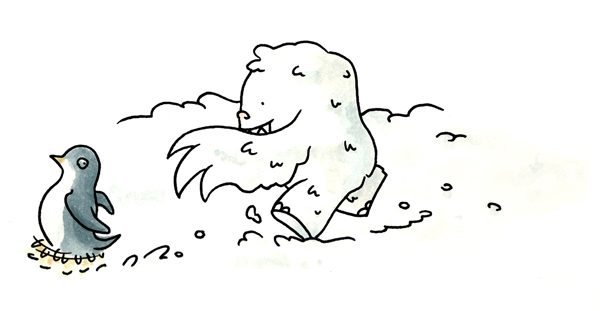 I feel bad updating late with only one sketch, though, so here’s a little yeti picture to tide you over until Friday. I hope you guys have a great holiday (that is, if Thanksgiving is your thing)! See y’all on Friday–on time this time! ← It’s getting too cold here.